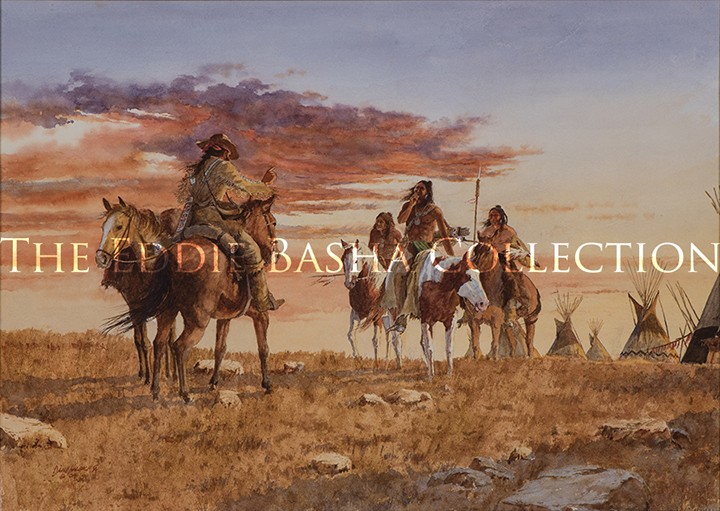 In 1985, David Halbach was inducted into the Cowboy Artists of America, the same year his painting Chippawa Hunter won the Purchase Award at the Buffalo Bill Historical Museum in Cody, Wyoming. The year 1986 marked his first place award for Region 11 in the Arts for the Parks competition. 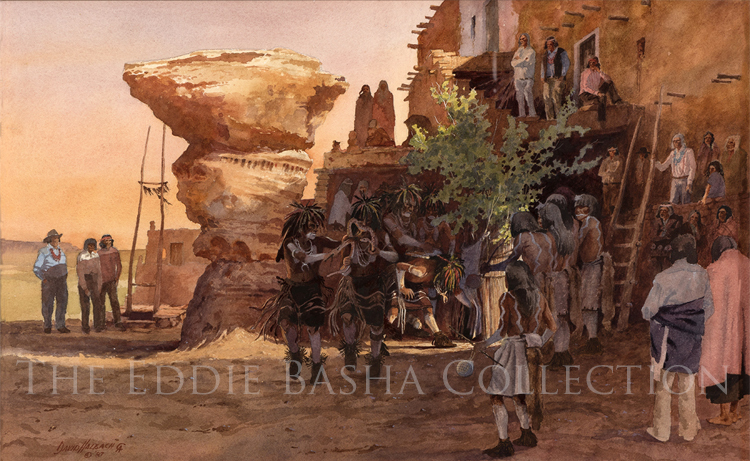 David was honored in 1990 with the Western Heritage Award given by the Favell Museum of Klamath Falls, Oregon, for excellence in portraying the West, past and present, in watercolors. 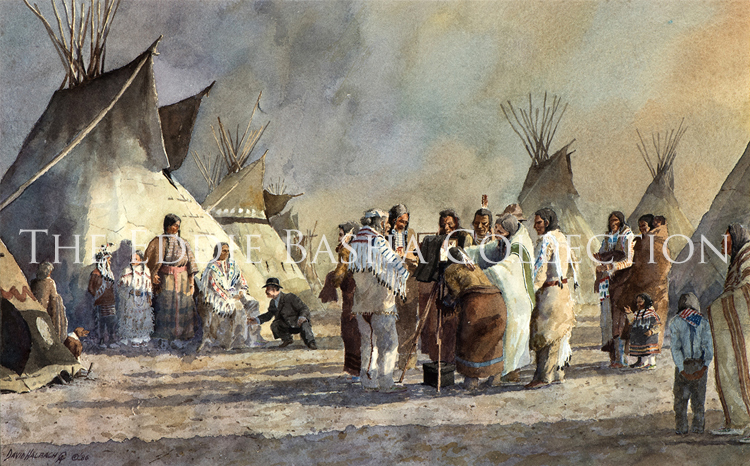 His painting Heading Out appears in The West, A Treasure of Art and Literature by Watkins & Watkins. 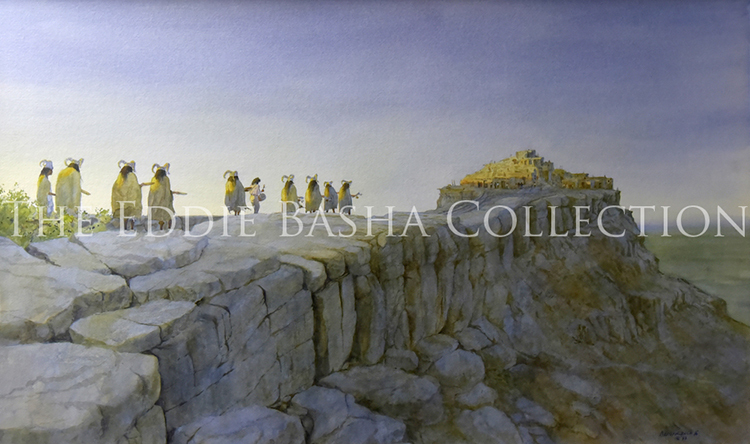 A graduate of Chouinard Art Institute in Los Angeles, David worked on Lady and the Tramp feature Disney film, taught art in the Los Angeles Unified School District and joined other artists in many invitational art shows and galleries. 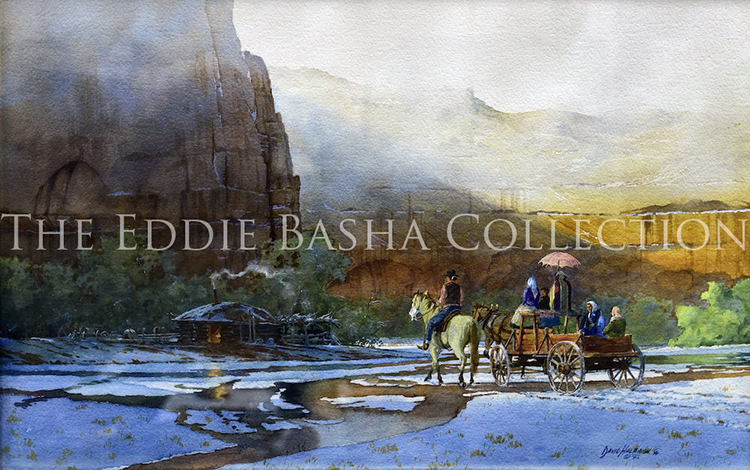 On his first invitation to the National Cowboy & Western Heritage Museum, he won the prestigious Silver Medal for his watercolor, Story Teller. In 1995 David was contacted by National Geographic to help complete a film project for children. 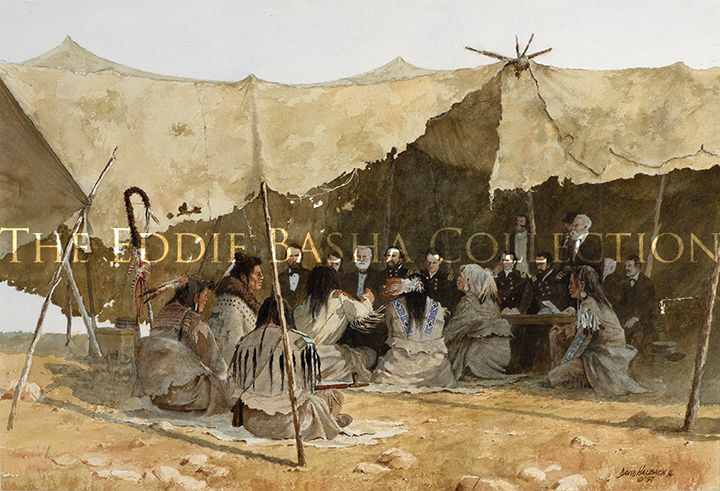 His paintings were used to depict the life of mountain men. In the summer of 2004, the U.S. Embassy asked to show one of David’s paintings in Ulaanbaatar, Mongolia, with the Arts in the Embassies Program, and his painting Forewarned was purchased by the Museum of Western Art in Kerrville, Texas. 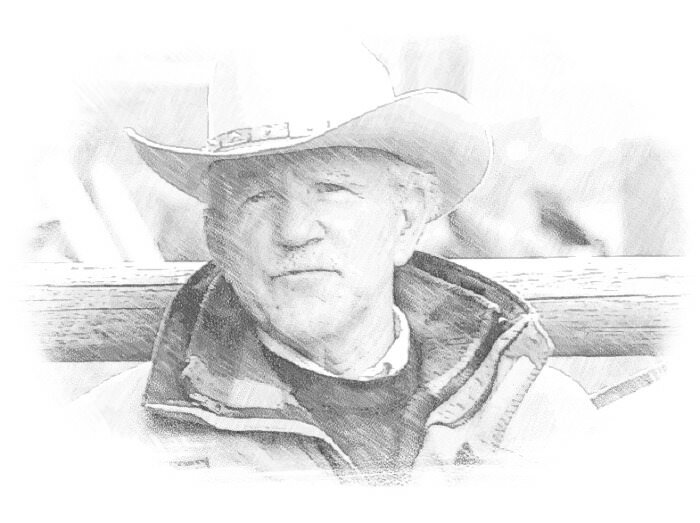 In 2006, David was selected as one of the top 100 artists in the 2006 Arts for the Parks Show in Jackson, Wyoming. During the past 18 years, David has won numerous CAA Gold and Silver medals. 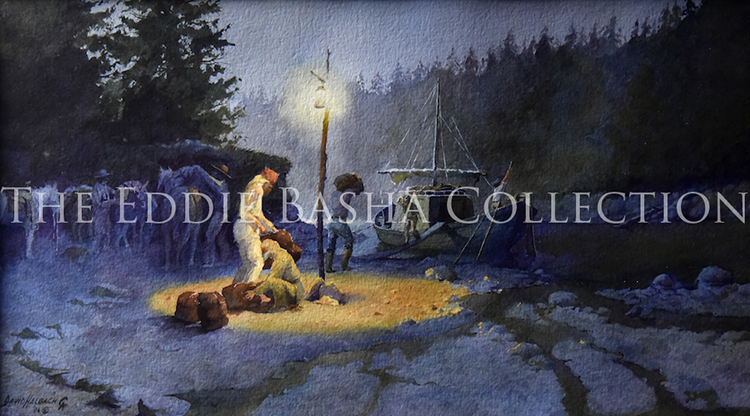 In 2010 he won the Gold Medal for Water Solubles for his painting Awaitin’ The Cow Boss. 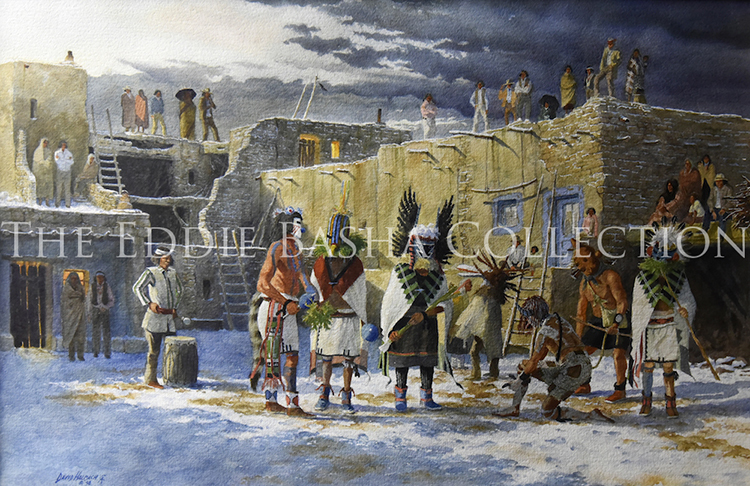 The Wuwuchim ceremony is part of the traditions of the Hopi Indians of North America. The history of this and other Native American cultures dates back thousands of years into prehistoric times. 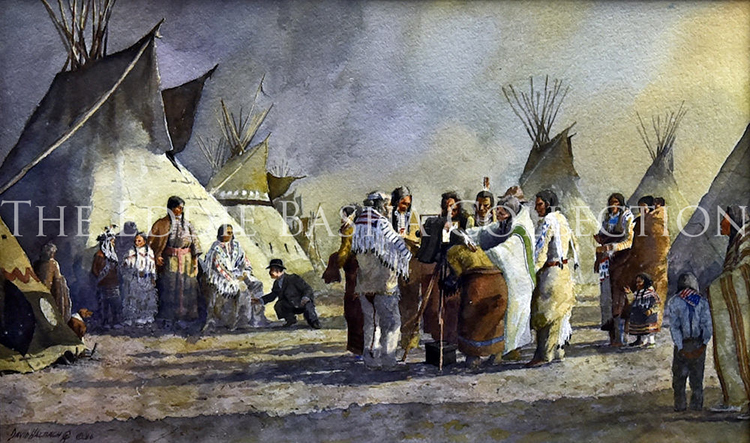 According to many scholars, the people who became the Native Americans migrated from Asia across a land bridge that may have once connected the territories presently occupied by Alaska and Russia. The migrations, believed to have begun between 60,000 and 30,000 B . C . E ., continued until approximately 4,000 B . C . E . This speculation, however, conflicts with traditional stories asserting that the indigenous Americans have always lived in North America or that tribes moved up from the south. The Hopi Indian ceremony known as Wuwuchim takes place in November and marks the beginning of a new ceremonial year in the Hopi calendar. 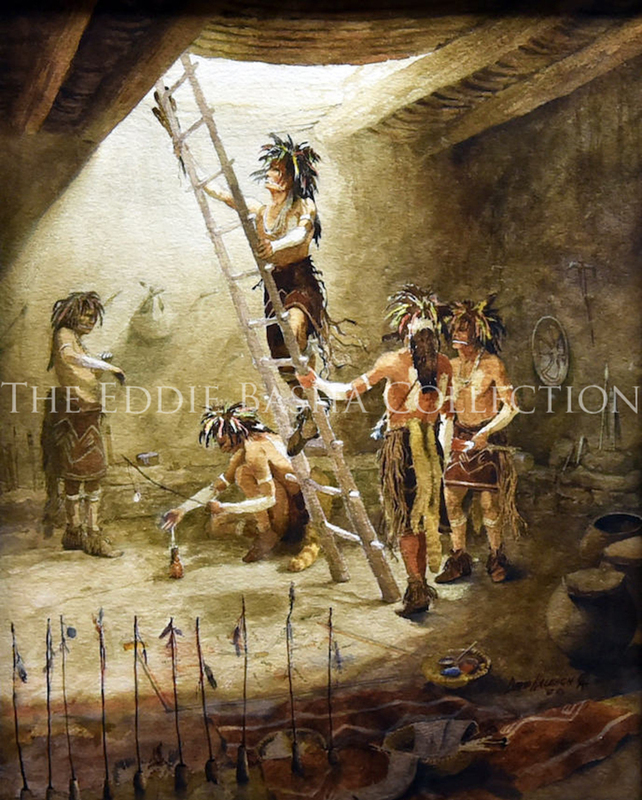 The name is believed to have derived from the Hopi word wuwutani, which means "to grow up," and the initiation of young men into the sacred societies that oversee this and other Hopi ceremonies is an important part of the celebration. The tribal elders close off all roads leading to the pueblo, all fires are extinguished, and the women and children stay indoors. The initiation rituals take place in the underground chamber known as the Kiva , where the adolescent boys are gathered and where they participate in secret ceremonies that introduce them to Hopi religious customs and beliefs. Although visitors and even other tribe members are not allowed to witness these rites, they are overseen by a tribal chief who impersonates Masau ' U , the Hopi god of death and the ruler of the underworld. After they have undergone their initiation, the young men are treated as adults and allowed to dance as kachinas in other Hopi ceremonies throughout the year. Wuwuchim is therefore essential to the continuing cycle of Hopi ceremonial life. The kindling of the new fire is the first ritual to take place during Wuwuchim. Other tribes observe this ritual around the time of the Winter Solstice , but the fact that it is part of Wuwuchim underscores the latter's importance as the start of the Hopi New Year. As the ceremony draws to a close, there are prayers, songs, and dances designed to ensure the safety and success of the Hopi people in the coming year.